Actually I was trying a Editplus text editor for few days. When I was trying edit+ text editor software I made it has a default text editor for few file type extension, in those extensions “.htaccess” is also one of them. Please check your filetype assoications. When I saw that error, I noticed that it is something related to file type extension association. So what I did was I changed file type association of .htaccess extension in windows file type association to default text editor like notepad. And now when I tried to open the same file, it still shows the same error message. So I thought that I need to change the settings in filezilla itself. So after checking all filezilla setting I got the option to change filetype association. 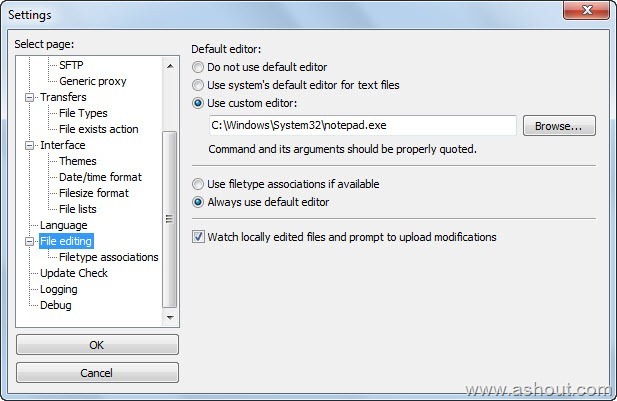 This guide is to change the default text editor in filezilla software. After choosing that option, below you will see Browse… button. Click on that button and navigate to any text editor location. 4. Once you select any text editor, now you click OK button. 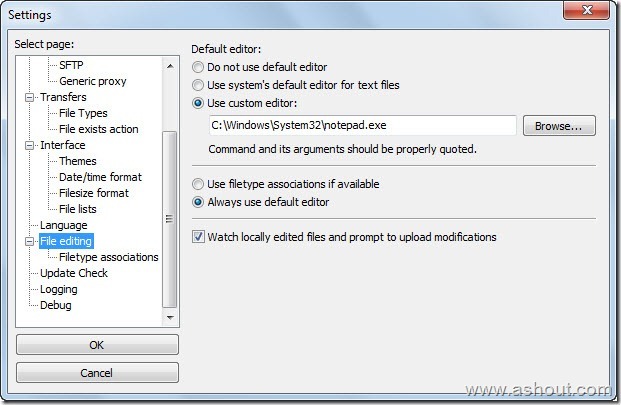 Now you can edit the file without any “Cannot edit file” error in filezilla.